Ta-Da! Voiceworks was established to address a need in the industry for personal service for both the talent and client alike. We aren’t just your agency of choice, we are your partner every step of the way! You will receive prompt professional attention regardless of the scope of your project. We listen, understand and produce. Our agents and staff have many years of experience in all aspects of the business and our strong client relationships that we’ve built over the years are a testament of our ability to understand the importance of great customer service. With over 20 years experience as a voice talent herself, Tanya’s extensive background has paved the road as a successful agent/manager to other voiceover talent. Her highly attuned business acumen and focus on “hands on” customer service has made Ta-Da! 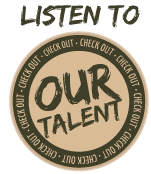 Voiceworks a talent agency that everyone loves working with! Rob’s knowledge of the voiceover industry along with his passion for seeing talent succeed in the business, makes him a great agent to have! Along with handling a roster of talent at Ta-Da!, he also is responsible for running the day to day operations at Ta-Da! Voiceworks.